Official English website is now Mobile Compatible! Our official English website is now mobile compatible, which is viewable on smartphones and tablet PC. 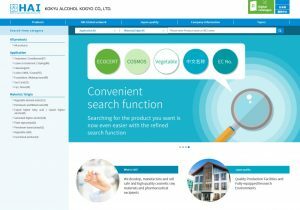 Also Product Search is newly available on English website. It’s easy to find product information, such as Chinese INCI and COSMOS. 次ページへ 次の投稿: New Company Profile Video is uploaded on YouTube!